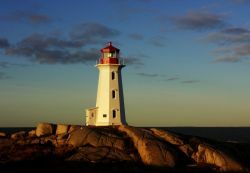 If you are a traveller who has been out to the East Coast recently you have probably stopped by Peggy's Cove to snap a picture of its famous lighthouse. If you have gone in the last year or two, you undoubtedly noticed the lighthouse looks less like the idyllic postcard image you had imagined. Chipped and faded paint caused by rough Maritime weather and federal neglect has left the lighthouse in a state of disrepair. The federal government plans on using updated navigational technology that renders lighthouses obsolete. This abandonment by the federal government of much of the historic maritime cultural infrastructure, not to mention its services and the economy, has seen many lighthouses close. Even the quaint and popular little post office in Peggy’s Cove lighthouse has been shut down. These days it feels like the federal government is pulling out of the Maritimes. If it isn't the military or big business the Harper Conservatives have no use for it. Closing multiple Service Canada offices, cutting staff, and changing the rules for Employment Insurance (EI) are just the latest abrogation of federal responsibilities in the Maritimes. It is easy to see why people in the Maritimes by and large have rejected Harper's vision of a federal government that favours big business while punishing those who use government services. But back to the Peggy’s Cove lighthouse. The government was intent on literally destroying the lighthouse until a tentative deal was reached with the provincial government. 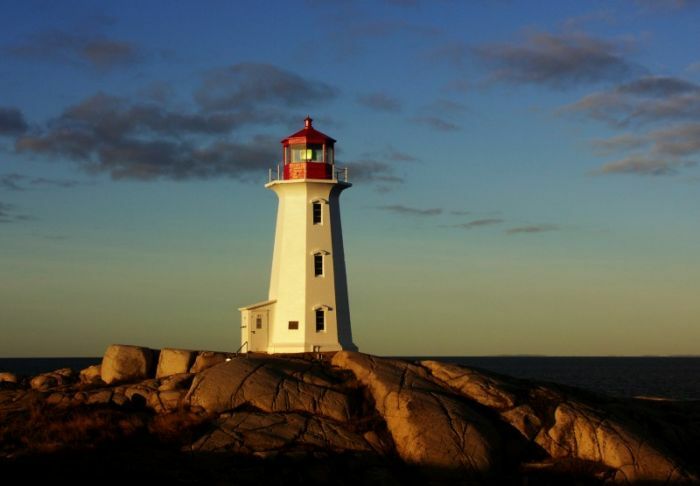 Nova Scotia will take over the lighthouse, though because no agreement has been finalized, the lighthouse remains dilapidated as the federal government refuses to maintain it. In the vacuum of federal responsibility District 39 of the International Union of Painters and Allied Trades offered up its skills and expertise to fix up the lighthouse. The union obtained the necessary approval and began its paint job in late August. The lighthouse is now fully repainted and looking as pretty as ever — though more maintenance work is needed. This gesture by unionized workers was extremely popular. It generated rare positive mainstream news stories about unions. However, behind this popularity lies a more sinister narrative of charity and volunteerism. Unionized workers traditionally did the job of painting and maintaining lighthouses. Now union workers volunteering their labour and supplies have replaced these once well-paying unionized positions. Instead of having a collective responsibility to maintain these sites and our rural communities in general, the government wants individuals and organizations to fill the void. This is a dangerous and unsustainable right-wing fantasy. Now, if the left were ever able to start organizing with a grander vision of social change in mind, then perhaps this crisis created by federal neglect could be seen as an opportunity to start organizing and building communities based on principles of solidarity and equality. For instance, when a massive earthquake rocked L’Aquila in the Abruzzo region of Italy in 2009 nearly 50,000 were left homeless. The Berlusconi government’s slow response meant that residents were left to their own devices to clear the rubble and rebuild. Leftist social centres from across Italy set up camps and began to help residents to clear rubble and organize in the absence of government services. The crisis of the government cleanup was also an opportunity to build a politics of solidarity and help rebuild L’Aquila upon the foundation mutual aid and collective struggle. This process is still ongoing and the strategy here is one based on long-term social change. In Canada it is clear that the federal government is trying to claw back services and shirk responsibilities whenever and wherever it can. This is not something unique to the Harper government, but it is a process that the Conservative Party of Canada (CPC) is looking to accelerate. The CPC have pretty much given up on Nova Scotians and the feeling is mutual. The slow pace of life and importance of government services in rural communities is anathema to the neoliberal wing of the CPC. It doesn’t help that they think that most Maritimers are a bunch of lazy dole-drawing do-nothings who are only useful as fodder on the tar sands. The point here is that in the absence of meaningful government services and punitive rules regarding EI, what are we supposed to do? This is a double-edged sword that replaces federal services and responsibilities with volunteerism. If we can formulate a response that is political, rather than simply a charitable gesture, we can begin to build and organize for meaningful social change. The painting of the Peggy’s Cove lighthouse was needed, but what is truly necessary is an organized working-class response to the federal government’s anti-worker policies that are destroying our communities. This blog was originally posted at rabble.ca.